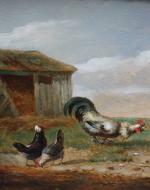 Animalistic painting with poultry yard was created by famous Belgian painter Frans van Severdonck (1809 - Brüssels - 1889). The Belgian painter Franz van Severdonck was born in Brussels, where he lived and worked all his life. It is not yet known, where the artist was trained, but his high compositional and technical skills allow the assumption of a professional training. 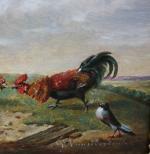 Franz van Severdonck was a master of animals and created numerous compositions with sheep, horses and chickens. His usually small-sized depictions are highly sought after collectable items on the international art market. Literature: Thieme/Becker "Allgemeines Lexikon der bildenden Künstler von der Antike bis zur Gegenwart", online Wikipedia. Inscription: signed lower right . Technique: oil on wood panel, original period gold-plated frame. Measurements: w 10" x h 7 1/8" (25,5 x 18 cm), framed w. 13 3/4" x h 14 1/2" ( 35 x 27,5 cm).